This year is gearing up to be a big one for the Roots, what with their forthcoming collaboration with Elvis Costello, an upcoming LP called & Then You Shoot Your Cousin, and the outfit's ongoing talk-show duties on Late Night with Jimmy Fallon. Apparently that's not enough for multitasking vocalist Black Thought, though, as he's revealed plans for an LP of his own. Speaking with Uber Urban [via Nah Right], the MC outlined a number of projects taking place outside of his regular activities, with one of them being a solo album that will explore the blues. "I just started writing a couple weeks ago for a blues album that I'm going to be singing on," he confirmed. 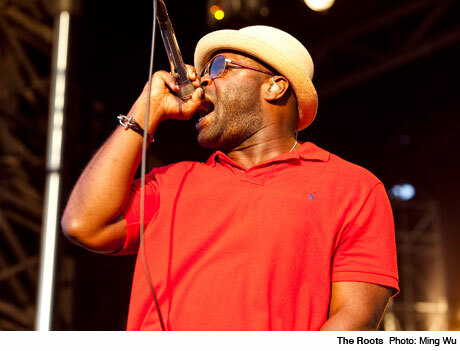 Black Thought hinted that the LP could be called The Talented Mr. Trotter, referring to his given name of Tariq Trotter, though the title's not set in stone. He added, however, that he's already written songs for the album with Grammy-nominated R&B singer Raheem DeVaughn and that he's about to hit the studio with TV on the Radio singer Tunde Adebimpe. Black Thought also mentioned he'll be working with My Morning Jacket's Jim James. "It's just some stuff that I feel I need to get out there, aside from the new Roots record," Black Thought said. The rapper also said that he's currently prepping an autobiography with Jeff Chang and Maori Karmael Holmes, though he didn't delve too much into the details. He added he'll be working on fashion-geared projects with footwear company Creative Direction and eyewear makers Moscot. As for the Roots, their full-length collab with Elvis Costello is reportedly dropping on Record Store Day (April 20), and the group's own & Then You Shoot Your Cousin is set to arrive either later this year or early in 2014.